The recent trend in bioprocess development toward small bioreactors and high cell densities presents challenges for accurate on-line monitoring of liquid cell cultures. Traditional on-line optical probes, such as transmission probes (also known as absorbance or optical density probes) and reflectance probes (also known as back-scatter or turbidity probes), typically require a 12 mm or larger diameter port into the bioreactor vessel and are limited in their linear response to about one order of magnitude of cell biomass range. In small bioreactors, such as 250 mL capacity vessels, the number of available large diameter ports is necessarily limited. Monitoring cell biomass from inoculation (e.g. <0.1 g/L dry cell weight) to harvest (e.g. >100 g/L) frequently requires at least three orders of magnitude of cell biomass sensitivity. Several factors contribute to the limited range of linear response of traditional transmission and reflectance probes. For reflectance probes, a frequent complication at low cell density is interference from reflective objects, such as impellers or other probes in the bioreactor. Such interference can lead to an S-shaped response curve, wherein interference at low biomass is gradually overtaken by reflectance from cells at higher biomass. For absorbance probes, the well-known break-down of the Beer-Lambert law is manifested as a flattening of the absorbance curve at high concentrations. A past approach to extending the useful range of optical probes has been to fit a curve to the response beyond the linear range. But this technique suffers from increasing inaccuracy as the response increasingly deviates from linearity, especially if the causes of nonlinearity are not consistent across bioreactor runs. The center of the linear range of an optical probe is determined by the path length that light must travel through the medium to get from the source to the detector. Decreasing this source-detector separation has the effect of shifting the linear response range to higher biomass. One approach to extending the range of biomass is to use several probes with different path lengths to monitor the same process. This technique is typically precluded in small-scale bioreactors due to space limitations. An alternative approach is to measure cell biomass reflectance through the bioreactor wall, such as the BE2100 sensor manufactured by BugLab. This noninvasive method eliminates the risk of contamination from the sensor. Three source-detector pairs are incorporated into a single sensor, and are automatically arbitrated between in order to maintain linear response to biomass over three orders of magnitude cell biomass.1 This approach has been successfully employed in vessels having volumes of 500 mL and larger. To accommodate the trend toward smaller vessels, a more recent approach (BE3000 probe), uses a small diameter (e.g. 3 mm) fiber optic probe measuring back-reflectance at 1310 nm. At this wavelength, water absorbance limits optical penetration into the medium to 3 cm or less.2,3 At shorter wavelengths (i.e. towards the visible region of the spectrum) the penetration depth increases due to weaker water absorbance. For example, at 850 nm the penetration depth into the medium can be more than 10 cm. Particularly in small vessels, this can make it difficult to avoid interference from other probes and objects such as impellers. At longer wavelengths, the penetration depth into water rapidly diminishes due to increasing absorbance of light by water. For example, at 1450 nm, the penetration depth is less than 1 mm. This has the effect of reducing the effective measurement volume to such an extent that the sensitivity to cell biomass is substantially diminished. At 1310 nm the measurement volume is small enough so that measurements can be made in small vessels (e.g. as small as 50 mL in a 250 mL vessel), while at the same time maintaining a very wide linear range of sensitivity to biomass.3 The optical reflectance of Saccharomyces cerevisiae in a 250 mL vessel is shown in Figure 1, measured at 1310 nm as a function of more than four orders of magnitude of yeast dry cell weight. This graph shows the optical reflectance of a liquid culture of Saccharomyces cerevisiae as a function of yeast dry cell weight. The culture was maintained in a 250 mL bioreactor, and optical reflectance was measured at 1310 nm. 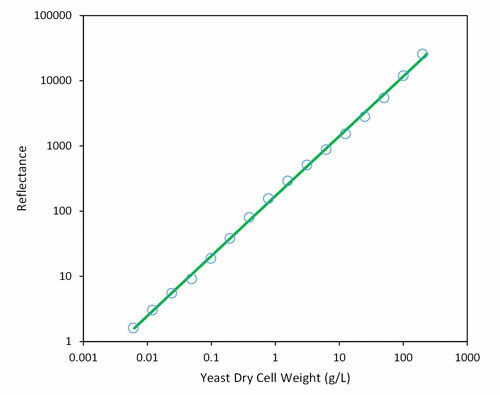 Notice that both optical reflectance and yeast dry cell weight vary over four orders of magnitude. One of the most well-known sources of interference with on-line optical measurements of cell biomass is bubbles. For microbial cells grown in bioreactors, high gassing and stirring rates are often employed. By using a small fiber optic probe and a source wavelength having limited penetration depth, the BE3000 measurement volume is limited to approximately 200 µL or less. The number of microbial cells in this volume will be in the thousand to millions at the lowest concentrations of interest, and will range up into the millions to billions at high concentrations. As a result, the individual microbial cells that are inside the optically sampled volume will change over time as the cells move through the medium, but the mean number of cells will be nearly constant. The bulk scattering effects measured by transmission and reflectance probes is affected by the size of the scattering particles. For this reason, calibration is required in order to report biomass in absolute units such as dry cell weight or cell counts. The BE3000 instrument comes pre-calibrated for dry cell weight of Saccharomyces cerevisiae, E. coli, and the micro-algae Chlorella vulgaris. Calibration to other unicellular organisms or off-line methods is a straight-forward process. Martin P. Debreczeny, Ph.D. (martin@buglab.com), is the co-founder of BugLab.